Chef Lars Petersen of Steensgaard Herregårdspension in Millinge, Denmark teases the taste buds with his recipe for White Chocolate Mousse Flavored with Eucalyptus. In a large pan, boil the milk with the sugar and vanilla. In a bowl, add the cornstarch to the egg yolks and add a little bit of the boiling milk, stir and then add the rest of the milk. Pour the mixture into the pan and bring to a boil while stirring. Add the gelatin, stir and set aside. Mix pastry crème and white chocolate, and add the eucalyptus and mix with a beater. Mix in the whipped cream and let it set in a mould. Bring water, sugar and vanilla to boil and pour over the rhubarb, and then let cool. Continue to boil the infusion (without the rhubarb) until it has reached the desired flavor and color. Let it chill. Take the same recipe as for the consommé infusion. Put in 3 leaves of gelatin per liter. Chill and put in a Pacojet cup (or ice cream maker) and leave in the freezer for 24 hours, and then process it. 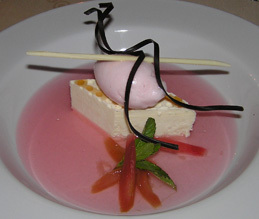 Use the rhubarb from the consommé as a garnish for the dish and arrange it with a variation of dark and white chocolate decorations. Read about Steensgaard Herregårdspension in the Restaurants and Hotels and Resorts sections. Read our articles on Denmark in the Destinations, Hotels and Resorts, Restaurants, Chefs' Recipes, Liquor Cabinet: Olfestival, Music Scene: Mickey Lee - She's The Girl Marie Marie, and Music Scene: Saxopaths Saxofonkvartetten. For additional information on Denmark please contact: VisitDenmark at www.visitdenmark.com, VisitAarhus at www.visitaarhus.com, VisitOdense at www.visitodense.com, Fyntour at www.visitfyn.com, and Wonderful Copenhagen ® at www.visitcopenhagen.com. For SAS Scandinavian Airlines information, please contact them at www.sas.se. For information on DSB rail service, please contact them at www.dsb.dk. © November 2006. Luxury Experience. www.LuxuryExperience.com. All rights reserved. All copyrights reserved, Luxury Experience Company.